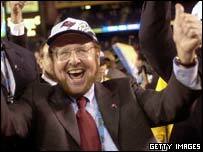 Sports tycoon Malcolm Glazer is within a whisker of taking full control of Manchester United with his £790m ($1.5bn) takeover bid. A spokesman for Mr Glazer said he now owns 74.81% of the club - just short of the 75% he needs to take it private. Mr Glazer confirmed that the offer would be 300 pence for each Manchester United share, valuing it at £790.3m. On Thursday, he bought the 28.7% stake of Irish racing tycoons JP McManus and John Magnier. Earlier, the US tycoon unveiled full details of his £790m bid. He plans to borrow £265m to fund the deal, set against the club's assets. He knows he will get to 75% now, but the question remains as to whether he will get above 90%"
He will also raise another £275m by issuing securities but this debt will not be held against the club's assets. And he will use £272m of his own cash, in the form of United equity already owned by him. "We are delighted to make this offer to acquire one of the pre-eminent football clubs in the world," said Mr Glazer's son Joel who is expected to take charge of the running of the club on a day-to-day basis. "We are long-term sports investors and avid Manchester United fans." In response, Manchester United said it would wait for the "full facts" to become available before advising shareholders whether to accept the offer from Mr Glazer. The buyout is still facing fierce resistance from United fans. Further demonstrations are expected to follow Thursday night's angry scenes outside the club's Old Trafford ground where five fans were arrested after hundreds gathered to protest, armed with banners and burning effigies of Malcolm Glazer. Fans still hope to stop Mr Glazer. Supporters already own an estimated 18% of the club and have tried to secure financial backing from Japanese bank Nomura to buy more shares to block his attempt to delist the club. 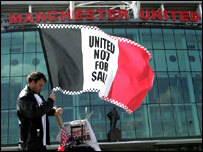 Fans have also threatened to boycott the club's money-spinning merchandise machine. Their fear is that - under Mr Glazer's ownership - ticket prices will soar, and ultimately Mr Glazer will delist United from the London Stock Exchange as well as the club being weighed down by £265m in debt. Debt has already crippled less successful high-profile clubs in the UK and pundits believe Mr Glazer may saddle the club with heavy debts. "Manchester United will clearly be in a weaker position financially." Fans also fear that funds which could be used to buy new players for the team will be diverted elsewhere. Analysts believe it is only a matter of time before Mr Glazer gets the shares he needs. "He knows he will get to 75% now, but the question remains as to whether he will get above 90%," said Hilary Cook of Barclays Stockbrokers. Once Mr Glazer has raised his holding to 75% or more, then he can rewrite the company's articles - effectively giving him carte blanche to run the company as he wants. If he can get 90% of the stock, he can make a compulsory purchase and scoop up the other 10% of the club's shares. In Friday's trading, United shares added 1.5 pence, 0.5%, to 300.75p, above the 300p a share Mr Glazer paid for the stake held by Mr Magnier and Mr McManus. Fans' fears have been fuelled by the fact that Mr Glazer has yet to make his intentions for the club clear. Mr Glazer first showed an interest in buying the club last autumn and tabled a formal proposal in October, which was rejected by the board. The owner of the Tampa Bay Buccaneers American football team is thought to be keen to exploit the strength of the Manchester United brand in the US. The UK's constitutional affairs minister Harriet Harman said the government had urged Mr Glazer to have talks with fans, the Football Association and the club in order to ensure there was "constructive involvement". She told BBC One's Question Time: "Manchester United is very important to English football and the government is keeping a very close eye on the situation. "The fans are very worried." Thursday's bid came five days ahead of the 17 May deadline for Mr Glazer to make known whether he planned to bid.